I hope you’re all doing well, it’s been a very long time, and I’ve neglected my blog for a hot sec (shakes head), but I’m back now. It was just one of those moments where life happens and I just really needed time to focus on my one-to-one relationship with GOD! This section of godly lady after Gods own heart will basically be small pieces about what is happening with me. I intend on being honest, as I do not desire to put up a front, because believe me, the Christian life is not a walk in the park (the road is NARROW and DIFFICULT [Matthew 7:14]), but God makes all things work together for our good [Romans 8:28]. So in today’s short piece/section whatever you wanna call it, I’m going to be talking about the word ‘LOVE’! Recently I found myself feeling some strange kinda way, pretty difficult to explain clearly. I wouldn’t say low, I wouldn’t say discourage, maybe somewhere in between the two? I was border line fanatical about something which I didn’t possess (a relationship that would lead to marriage). I was in love with the idea of being IN LOVE. Now there is nothing wrong with desiring marriage, as marriage in itself reflects Christ’s love for the church His bride. God created marriage and marriage is GOOD, and God says in His word that He will grant our hearts desire [Psalm 37:4], as long as they’re in line with His will for us. But this desire started to consume, and it’s all too easy for us humans to worship the blessing (creation) rather than God the creator. I began to find it difficult to pray, not only because of feeling ‘love sick’, but because I began to let the cares and worries of life crowd out Gods word from my mind. But in my lowness I heard Gods voice, and that’s when I realised I already possessed the greatest love [John 15:13]. Me obsessing over something I did not have meant I was being covetous. I began to idolise marriage. And when I looked at it from Gods perspective I was basically saying to God, your love is not enough. And to go even further, your death on the cross is not enough it doesn’t satisfy me. But praise God, God is so gracious and merciful and FAITHFUL! He’s always there to lift us up when we fall down. So what happened was the Spirit gently ministered to me that I already have the greatest love [please please read John 15:13 it explains just exactly what true love is]. I was already in a great relationship, a relationship with Jesus Christ. Nothing or No one can ever take the place which is meant for God, as if we try to replace Christ with anything or anyone, we will always end up dissatisfied and empty. My final note to you ladies out there is to be PATIENT. If God has revealed to you that it is in His plan for you to be married, then trust Him it’s gonna happen! I mean He had this planned out before the foundations of the earth were laid mate, so CHILLLL [Jeremiah 1:5]. I’m also speaking to myself here so please do not take offense. I read Jeremiah 1:5 in this particular circumstance as ‘Before I formed you in the womb I knew you, before you were born I set you apart, I appointed you to be a wife to your husband’. << This is just a paraphrase, check out the verse for yourself! Also I’m ever so grateful to God for providing us with the story of Abraham and Sarah in the bible [Genesis 18:1-15]. I say this because it teaches us a very valuable lesson of what happens when we do things in our own strength. Sometimes we might try to ‘help God out’, but He really doesn’t need our help, because generally we just make things worse. I mean God told Abraham he would have an heir, but Sarah probably thought ‘Hmmm maybe the heir will come through my servant as I’m too old’. But God was probably thinking ‘naarrr Sarah I said YOU will be with child, I didn’t mention anyone else.’ So ladies for those of you who have willingly chosen to enter a relationship you know is not godly, or has absolutely 0 chance of working, leave that relationship now! Ask the Holy Spirit to direct you. Gods probably like ‘Girrrlll I sorted out your prince timmmeeee ago, in fact it’s gonna to be a real surprise, just wait for my timing’. I’m very sure Gods plans for you will BLOW your mind [Ephesians 3:20]. I can hear some ladies say ‘But even my guy friends are in relationships, and men are supposed to get married later than women’. 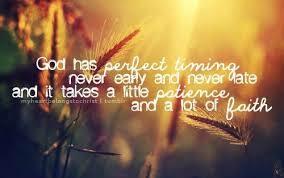 Listen GODS TIMING IS BEST. As the book of songs of Solomon says ‘Do not awaken love before its time’ [Songs of Solomon 8:4 & 2:7]. That’s my message/word of encouragement for y’all wait patiently. And it’s also very very VERY VERY VERY important not to WASTE your singleness, use it for the glory of God, and guard your heart at ALL cost. God bless y’all beautiful ladies, enjoy your week.